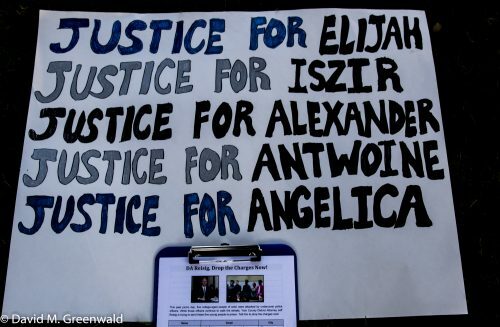 Alexander Craver, Antwoine Perry, Iszir Price, Angelica Reyes and Elijah Williams each face felony charges for a violation of section 245(c) of the California Penal Code which describes assault by means of force likely to produce great bodily injury on a peace officer. This week, activists gathered in the park to demand that the charges be dropped. Paul Fullerton and his wife Maricel were scheduled for a preliminary hearing on Friday in front of Judge David Reed. Mr. Fullerton faces multiple felonies on accusations he sold marijuana out of his Woodland store, Lil Shop of Growers. There is also an enhancement for possession of a firearm during the commission of a felony and a charge of child abuse. A raid was conducted February 29, 2016, following an extensive undercover criminal investigation by the Yolo Narcotic Enforcement Team (YONET). The YONET team had received information that Mr. Fullerton was allegedly selling marijuana out of his Woodland, CA, business, and then arranged for an undercover YONET informant to purchase marijuana from Mr. Fullerton. On Friday, the defense asked for a delay as they had received what was described as “exculpatory evidence.” Deputy DA Garrett Hamilton, sitting in for Kyle Hasapes, agreed to the continuance with the preliminary hearing now scheduled for August 29. Meanwhile, there will be a hearing on August 1 in which the judge will rule on a Pitchess motion to access an officer’s personnel file. The defense then appealed to the 3rd District Court of Appeals, but were summarily denied. They have apparently refiled and Judge Mock, sitting in for Judge Reed, was prepared to rule but there were no attorneys available from the custodian agencies. The jury hung in his trial on the murder charge, but Mr. Hendrix on Thursday was still sentenced to 42 years in prison. District Attorney Jeff Reisig announced that on July 20, 2017, the Honorable Paul K. Richardson sentenced 33-year-old West Sacramento man Steven Hendrix on two separate cases. First, the Court sentenced the Hendrix on one count of gross vehicular manslaughter while intoxicated, one count of driving while under the influence causing injury with an enhancement for injuring multiple victims, and four separate counts of child endangerment. Next the Court also resentenced Hendrix in a domestic violence case from 2015 which included two counts of felony domestic violence from two separate dates. Hendrix had been convicted of the domestic violence case on February 19, 2016 and was allowed to stay out of jail after posting bail. Hendrix then committed the vehicular manslaughter just five days later on February 24, 2016. In May 2017 a jury heard four weeks of evidence. The evidence showed that on February 24, 2016, the Hendrix drove a car at speeds of over 80 miles per hour in a 45 miles per hour zone on Second Street in Davis which is a two lane road. Hendrix was intoxicated by both methamphetamine and marijuana. Hendrix started tailgating one driver within just a few feet of the rear bumper. He then passed this driver in the bike lane as she was “driving like Miss Daisy.” While passing this driver the Hendrix came within a few feet of side swiping a bicyclist who was riding well within the bike lane. Hendrix then passed another car in the suicide lane after passing the bicyclist. As Hendrix started to weave back into the normal lane of traffic, he crashed into 71-year-old Cynthia Jonasen as she turned off Cantrill onto Second Street.